On the 16th, 17th and 18th of June 2017 we will hold our UK seminar in Stirling with Hanshi Kazuyuki Hasegawa(9th Dan) President of the Kyokushinkaikan World Sokyokushin. We would like to invite all of you to attend it and meet the greatest Karareka who created a 3 times world champion in Kyokushin history. Hanshi Hasegawa is the one of best students of Sosai Oyama and was an All Japan champion in 1970, defeating many strong fighters in that period. The venue is The University of Stirling in Scotland, United Kingdom. There are only 40 places available so please book soon. The seminar fee will be £185 and a non-refundable deposit of £85 secures your place. This fee includes your accommodation (Per person in a single room) breakfast, lunch, dinner including the Sayonara party. We will hold Kyu and Dan gradings under Hanshi Hasegawa, please contact if you are interested. Please get in touch with me if you have any questions. I hope to see you in Stirling, United Kingdom next year. Hanshi Kazuyuki Hasegawa enrolled at the So-Honbu in Ikebukuro / Tokyo in 1967. He competed in the 1st All Japan Karate Open Tournament and took 3rd Place. Next year he became the Champion of the 2nd All Japan Karate Open Tournament. At that time he scored an ippon for performing a perfectly timed Ashibarai followed by a Gedan Gyaku-tsuki, Hanshi Hasegawa’s special technique. Hanshi Hasegawa raised several of his students to obtain the same title. Sosai Masutatsu Oyama appointed him as Branch Chief of Tokushima Prefecture in 1971, and a couple years later Sosai also entrusted him Aichi Prefecture. In 1999 Hanshi Hasegawa received the Shakai-Bunka-Korosho (Cultural Award of the Community) from the Bunka-Shinkokai (Association of Cultural Development), this was the first time this award was given to a member of the Karate Kai. He is also the author of several Kyokushin Karate books. 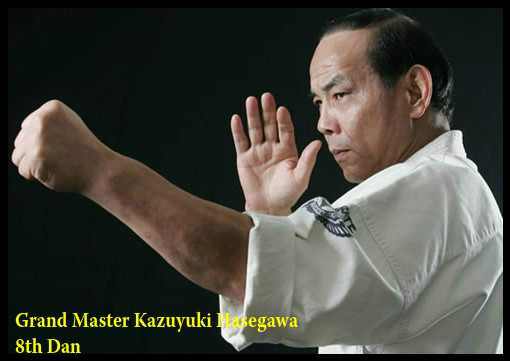 As Hanshi Hasegawa is 9th Dan, he is one of the highest rank Shihan of the Kyokushinkaikan and at present he is the president of the International Karate Organisation Kyokushinkaikan World Sokyokushin.